Yet another member of the salmon family, the silver or Coho salmon is one of the most exciting to fish for largely because of its attitude when hooked. It is also a delicious tasting salmon that can sometimes run in very large numbers. If you see large congregations of fisherman in the fall, in Alaska, they are probably on a silver stream. 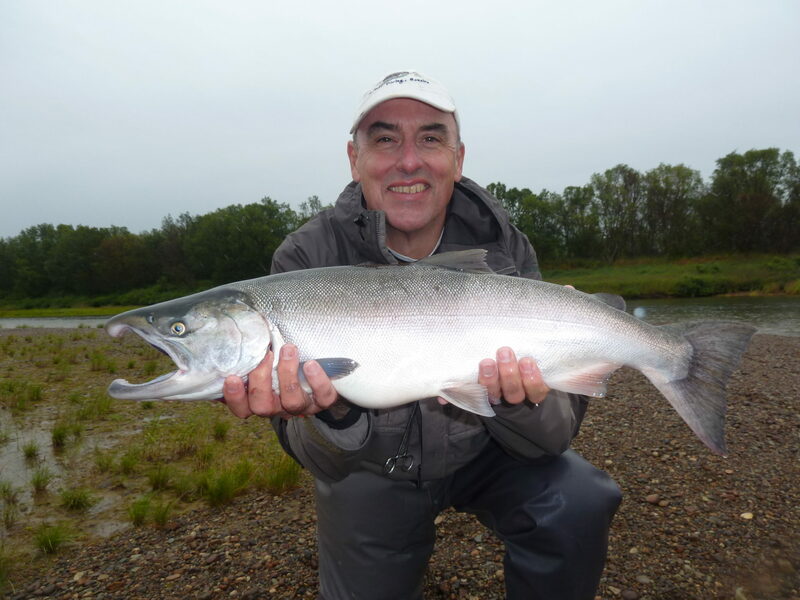 Let our fly fishing guides show you where some of the best silver streams in Alaska are. The silver salmon’s range encompasses a large portion of the North Pacific Ocean, from Japan and eastern Russia, around the Bering Sea to mainland Alaska, and south to Monterey Bay, California. In Alaska, they can be found in coastal waters from Southeast to Point Hope on the Chukchi Sea, and in the Yukon River to the Alaska-Yukon border. In keeping with the life cycle behavior of other Pacific salmon, silver salmon are anadromous, hatching in fresh water but maturing in salt water to mature. They are highly adaptable and are found in nearly all accessible bodies of fresh water. Once mature, they return to fresh water to spawn in streams from July to November. Silver salmon can grow to be anywhere from 24 to 30 inches long and weigh between 8 and 18 pounds. Adults have a bright silver color and are spotted on their back and the upper lobe of their fin. The spots are small and black. While similar in color, silver salmon can be distinguished from Chinook salmon by the lack of black spots on the lower lobe of the tail and by their white gums. Chinook have small black spots on both tail fin lobes and black gums. Silver salmon, “the fall prince” of salmon, runs from July to November, with peak time for fishing them being August and September. Some river systems may have adult silver salmon present for 10 months of the year. While their average weight is 8 to 18 pounds, adults can range anywhere from 3 to 25 pounds! The largest silver salmon caught on record was 26 pounds—landed in 1976 by Andrew Robbins while fishing the Icy Straight. Southeast Alaska, Kodiak, Bristol Bay and the Kenai Peninsula are home to some of the largest runs of spawning silver salmon. The Tsui River also experiences a massive run of over 120,000 fish. They typically congregate in shallow stream margins, eddies, sloughs, estuaries and streams in areas where there isn’t a strong current. However, because they are so highly adaptable, they are plentiful in many different bodies of water. Silver salmon are acrobatic fish with aggressive fighting patterns when hooked. They tend to make long, blistering runs with multiple summer-saulting jumps. Typically caught sub-surface, they are also very aggressive surface strikers at times. Brightly colored flies, silver lures and any kind of motion works very well at attracting them in different kinds of water. Silver salmon are attracted to erratic, jerky movements. So keep your rod tip in the water, pointed at your fly and vary your strips and retrieves. When surface fishing using a popper or wog, try a very fast strip and you will often see a wake behind the fly as the silver chases after it. Keep it interesting for the fish and you’ll find the technique that works best. Also, be careful not to jerk your rod back too quickly, let them take it. Do you have the urge to pursue the “prince of the fall”? Book a fly fishing expedition with No See Um Lodge today for your chance to land some of the most sought-after sports fish in Alaska!